I have scored some pretty good deals after Christmas – wrapping paper, tape, bows, a $3 candy cane necktie for Davis, a storage bag for my fake silver trees, Christmas Peeps, and two tree-shaped candle tapers. All your basic grab and go after Christmas bargains. Or were they? Might I ask why a drone is following me on my excursion? I thought I was a pretty good bargain hunter but this takes shopping to a whole new level. Just send out your drones to seek the bargains and unnerve the competition. I have a video of it but for now you will have to see a photograph. (I am not set up to add videos on the blog but it is in the works and hopefully videos will happen soon.) 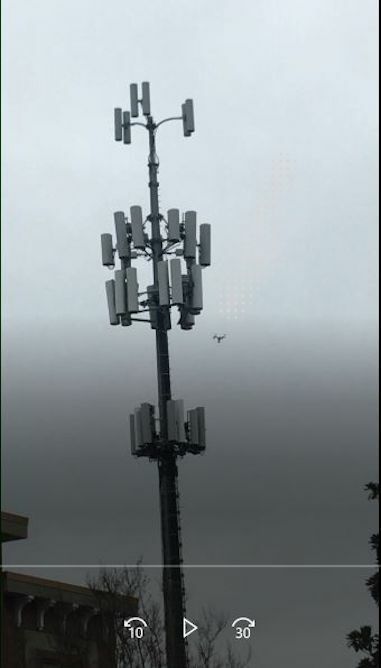 You can see the drone by the middle section of lights taken from the parking lot at Publix. Too bad for the drone shopper because I got all the Chocolate-dipped Peppermint Peeps at half price anyway. No drone is stopping me from this once a year delicacy. Next stop is downtown. Here is a photo of Atlanta on my way to Ikea. 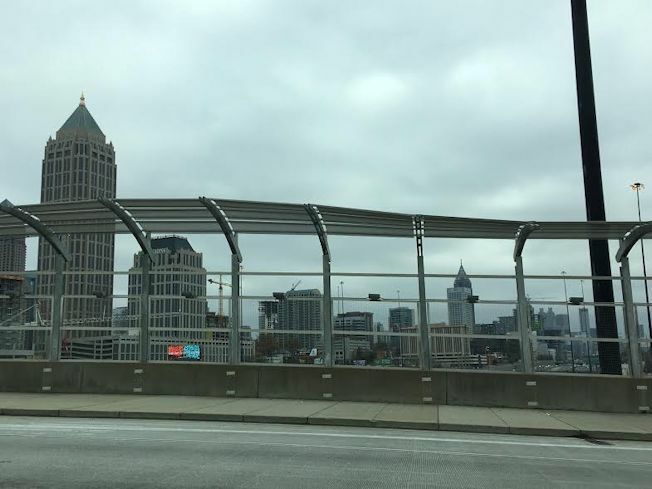 Atlanta looks pretty in the winter with its gray skies and gray bridges and buildings. And last, I found myself at KMart. 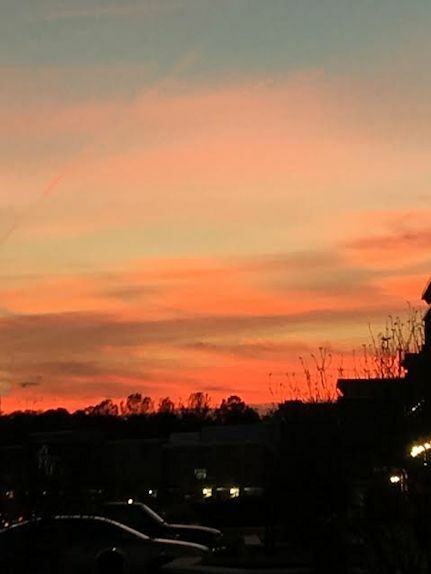 My shopping is coming to an end.. Gray skies in the daytime lead to gorgeous sunsets in the evening. With all that shopping I pulled a soup from the freezer for dinner. I like to have individual servings on hand for just an evening such as this. No garnishes tonight…just a quick and easy soup bowl reheated in minutes. I have the recipe and photos from the last time I made this soup so I will include them now. This year I have been making quite a few soups to freeze for my lunch or for a quick supper. I am replenishing my stash over the holidays. Use a sharp vegetable peeler to remove the hard covering of the butternut squash, discard. Scoop out the seeds from the inside. Cut the squash into pieces and boil in water until tender. Drain and keep the liquid for later. In a stock pot, melt the butter. Add the garlic and cook until garlic is softened. Add the ginger and stir until mixed. Add the flour and stir until smooth. Slowly add the broth stirring until all the broth is incorporated. 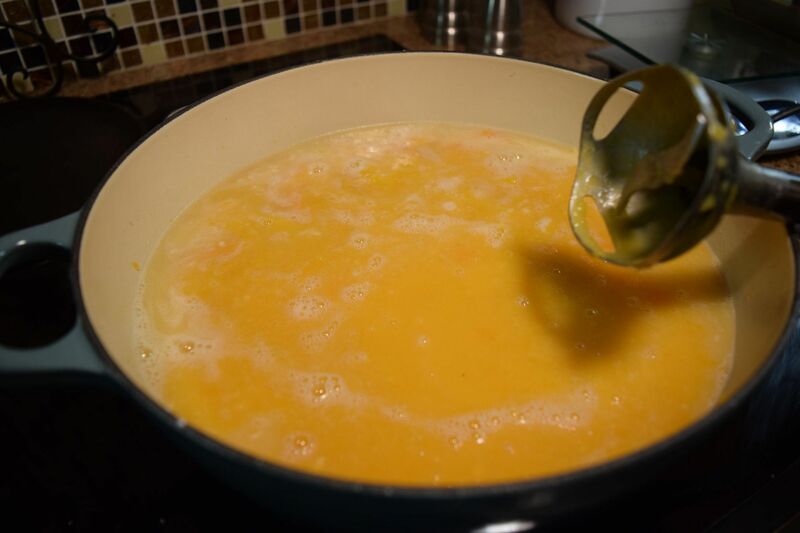 Simmer for 5-10 minutes until slightly thickened. Add the drained squash. 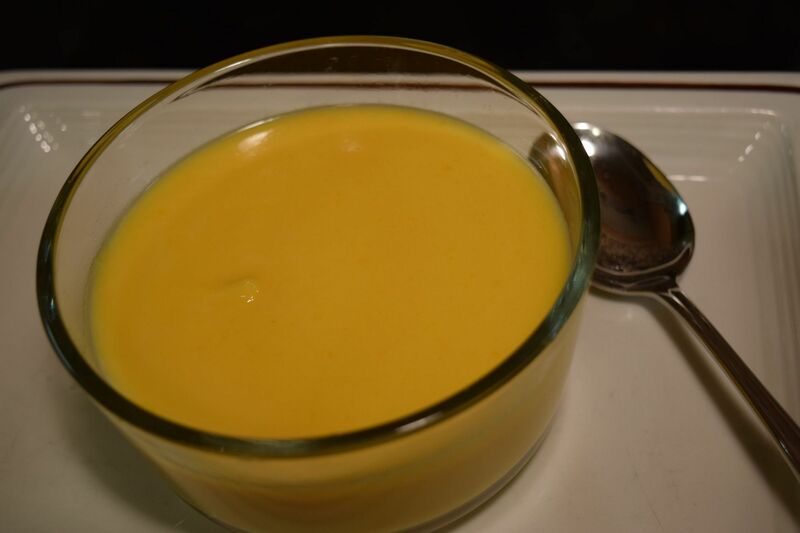 Use an immersion blender or stand blender to puree the soup. Add additional squash cooking water to desired consistency. Reduce heat and cook 10-15 minutes. Add the half and half and heat but do not boil. Serve with chopped, salted cashew pieces. 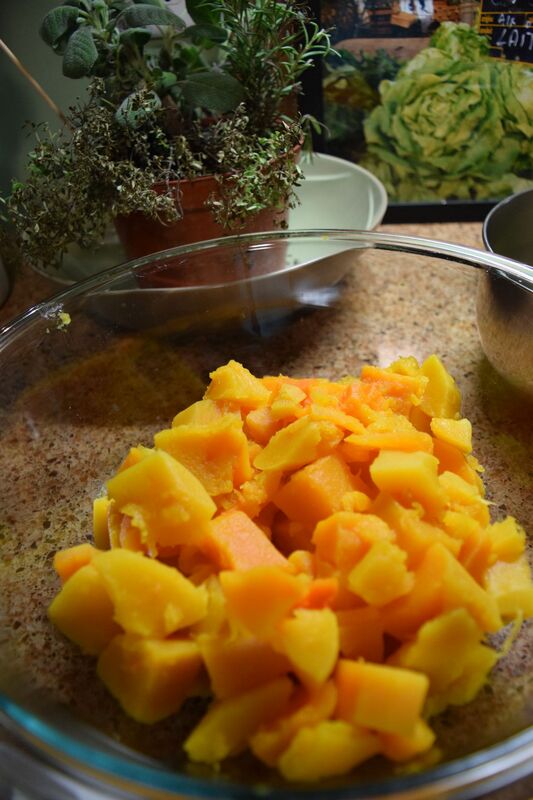 When you add the squash it doesn’t look as appetizing but wait for it….. Soon it is creamy and delicious! One serving (1 1/4 cup) is approximately 190 calories not including the cashews. 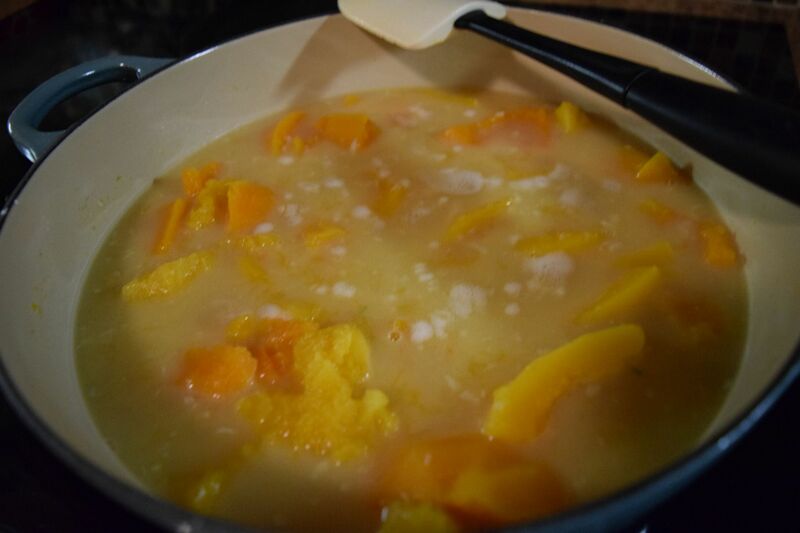 This is a delicious winter soup that freezes well and is tasty and filling. Now go forth and shop. You will have plenty of extra time because your dinner is already prepared and waiting for you.